After a few months of other distractions, I've recently returned to the study of bees. In particular, the 'Reed Bees' (Exoneura spp.). Exoneura was the very first genus I became familiar with, easily recognised by the cut-off shape to the body. But nothing is ever quite so simple. There is clearly more than one Exoneura species about! Fortunately, the two species I've been watching lately are visiting the same plant, so comparing them is made a little simpler. As Paul mentioned in an earlier post, one of the few plants flowering in the forest right now is Monotoca scoparia. 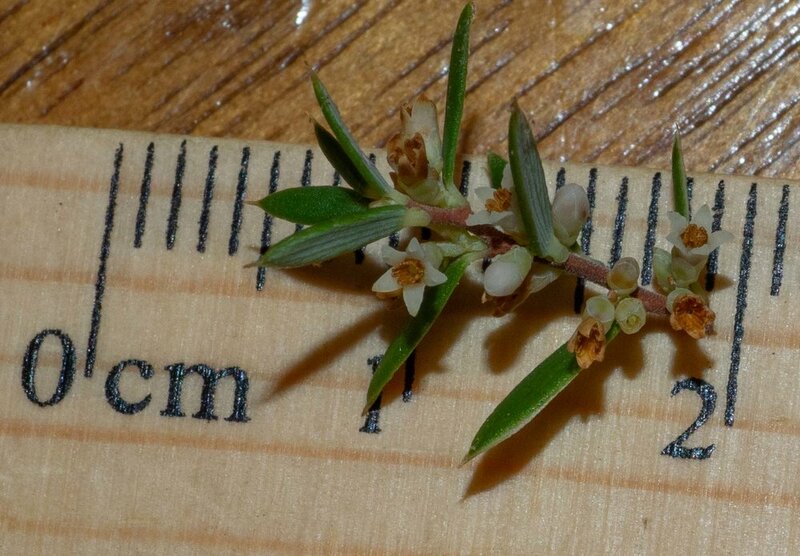 Monotoca scoparia flowers are tiny, and a useful scale for estimating the size of the bees. Both bees seem to tick the boxes in terms of Exoneura: flat end to the body (metasoma); black head and thorax (mesosoma); reddish-brown metasoma. And, as a cross-check, both show the features of the family Apidae: long-tongue; pollen-carrying hairs on the outside of the tibia. It is possible they are both the same genus, despite the vast difference in their sizes. There are nearly 70 species of Exoneura in Australia! 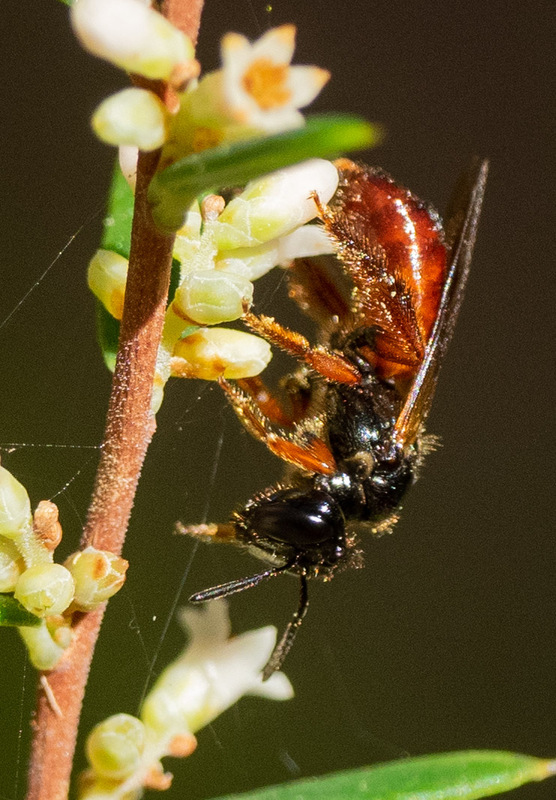 Digital photography is a wonderful tool for identifying insects. You can take loads of shots in the field and then spend hours at the computer, examining fine detail on a large screen. But there are a few traps. One trap is that a single shot of an individual insect can be misleading, simply due to the lighting or the angle. I therefore always try to take several shots of the same insect, from as many different angles as possible. But when there are many different individuals – as is the case with these bees – you really have to keep track of who is who. It's very important to know, with confidence, that two photos are actually of the exact same individual. The photos below are all labelled with letters to indicate which are multiple shots of the same individual bee. 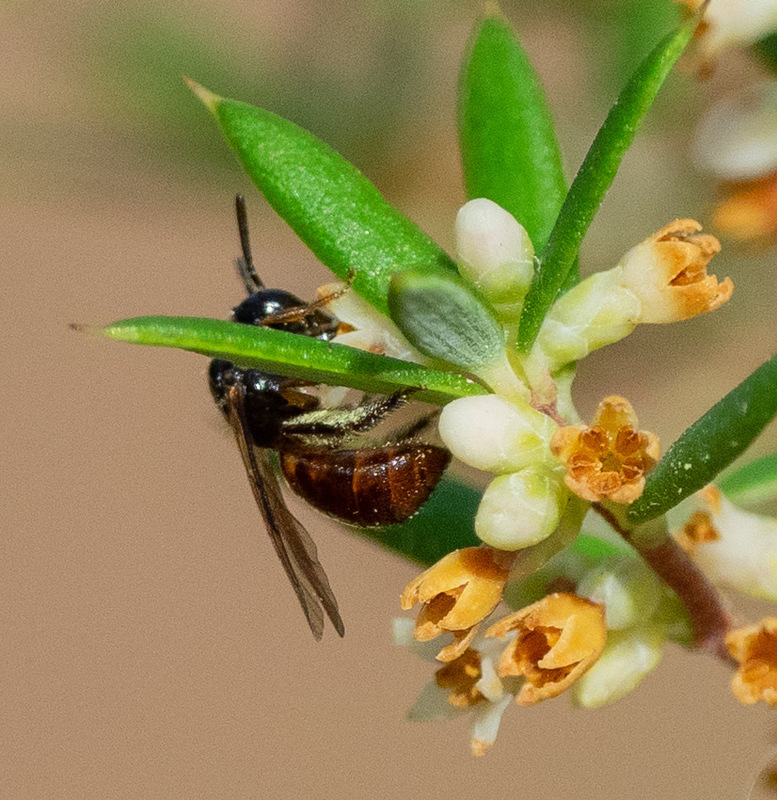 Of course, there remains the possibility that a single bee was photographed on more than one visit to the bush ... and therefore is gets more than a single letter ... but that doesn't really create problems for the purpose of species identification, so long as there are enough examples. 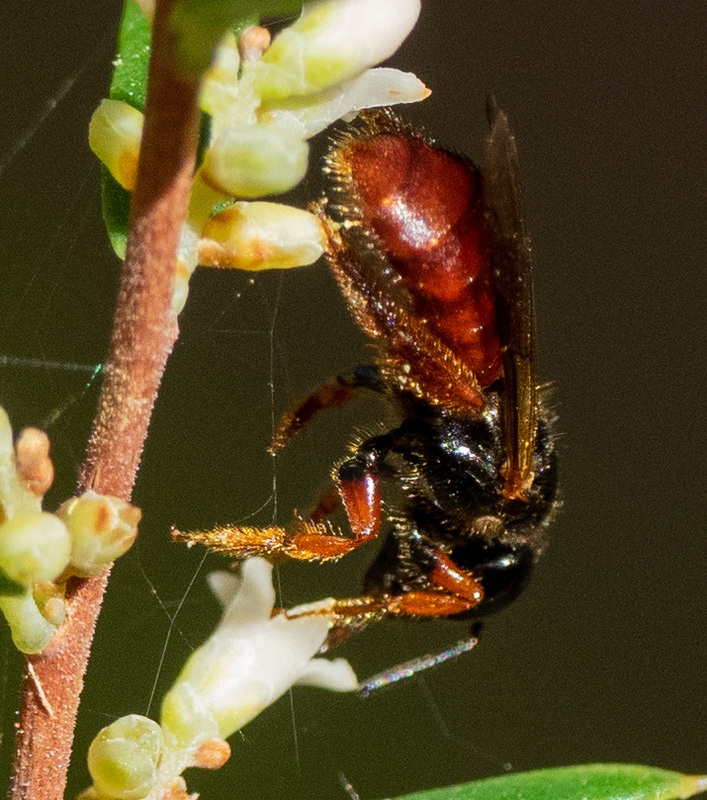 In one set of images, the bees are noticeably larger. They each have a rather bright red abdomen (metasoma) and yellow facial markings. 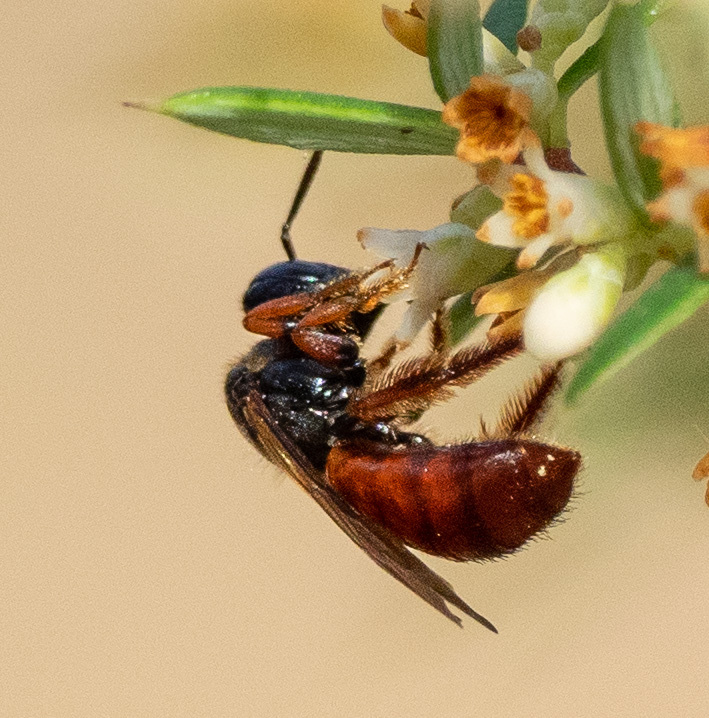 I'm tentatively calling Species 1 Exoneura robusta, simply based on its apparent match to images I've seen online. 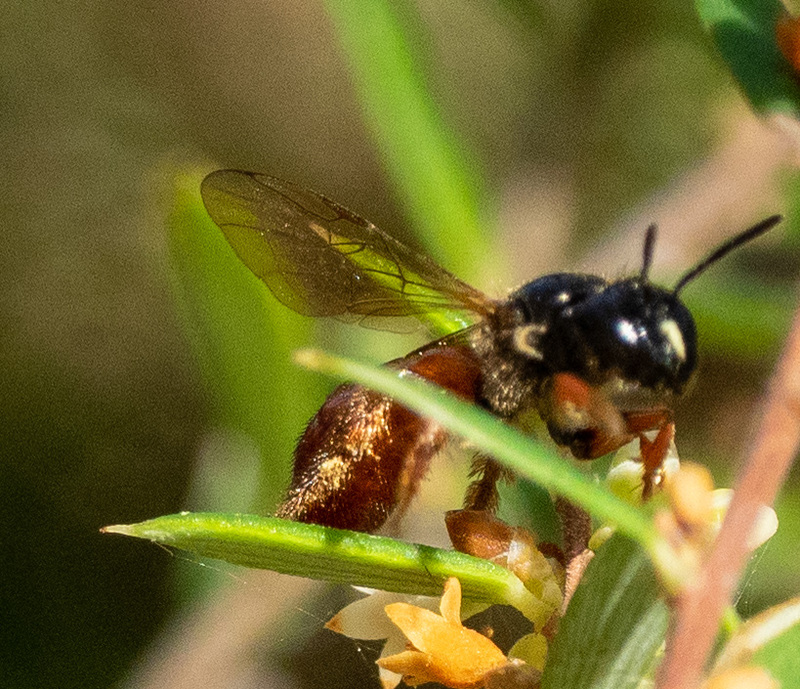 Exoneura robusta is reported to be an important pollinator of forest communities in the south-east of Australia. That fits! Species 2 is truly tiny. It's only because I was peering intently at the flowers that I even noticed these little ones. For now, I'm simply calling Species 2 Exoneura sp. – I can't hazard a guess at which species it might be. As I learn more I'm likely to revise these identifications. It's all part of the fun! And I continue to search for their nests. Females group together in shared nests, with some responsible for breeding and guarding the larvae, with others take on a foraging role. This social structure of Exoneura has been the subject of many studies, but is not the same as the truly social pattern of honeybees. And, no, Exoneura do not accumulate honey in their nests. That's a specialisation of very, very few species.